With Memorial Day under our belt, it's time to really dive into summer. And what better way to do that than enjoy all the delicious foods summer has to offer, courtesy of the grill! So dust off and heat up your backyard grill this week and get ready to enjoy fresh, delicious meals featuring summer's best produce. 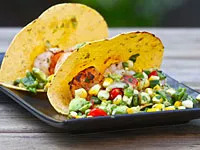 I recommend doubling the grilled salsa recipe for the shrimp tacos and serving it alongside chips or in a bean burrito for lunch the next day. The combination of grilled corn, peppers, and onions just can't be beat! 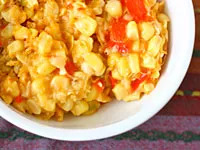 One of my favorite summer corn dishes—creamy, spicy, and absolutely delicious! 1. Preheat oven to 350 degrees. Cut kernels off cob and place in large bowl along with diced red pepper and jalapeño. 2. Melt butter in large cast-iron skillet over medium-high heat and, once melted, add veggies. Sauté for about 6 minutes, or until tender. 3. While veggies are cooking, mix together light coconut milk with cornstarch—stir well and set aside. 4. Transfer half of corn mixture into blender, food processor, or Vita-Mix and add coconut-milk mixture. Blend for only about 5 seconds, until pureed but still slightly chunky. Pour back into skillet with the rest of the corn. 5. Add maple syrup, salt, and pepper to mixture and stir well. Transfer to oven and bake for 40 minutes. Serve warm. An instant barbecue favorite, and a tasty substitute for a burger on a whole-wheat bun! 1. Preheat grill. Rub olive oil all over mushrooms and place on hot grill. Sprinkle liberally with salt and cook for about 5 minutes, until just soft and wilted. 2. While you're grilling mushrooms, make filling. In a medium-size bowl, combine all other ingredients and mix well until combined. 3. Stuff hot mushrooms with cheese and serve on a whole-wheat bun or plain. 1. Heat grill to medium-high. Brush corn, green onions, and poblano chile with olive oil and place on hot grill. You want everything to have a nice char to it—the chile should be black and the corn and onion should be charred. This will take about 5 minutes, flipping occasionally with tongs. 2. When done, remove veggies from grill and let cool on a plate. When cool, peel the now-black skin off the pepper, remove the seeds, and chop into small dice. Run knife down corn to remove kernels from cob and place into a bowl with pepper. Chop onion and place into bowl as well. 3. Add chopped avocado, cherry tomatoes, and cilantro to the bowl and add lime juice and salt. Season to taste and set aside while you prepare the shrimp. 4. Wash and devein if necessary, then grill a just few minutes until pink. Be careful because shrimp cook extremely quickly! When done, place into tortillas, top with salsa, and eat immediately!